1957 This edition of Toyon is the only edition to be printed on paper with a color other than black and white. The first few volumes were handed out down at the co-op in Arcata but this is also the first and one of the only volumes ever to be sold. ​1954 Year that Toyon was established by a small cohort of students. At this time, the journal was not supported or published with the English department and labeled itself a literary newspaper. The original editorial statement is pictured at left. Toyon was created by a group of students with the encouragement of the librarian Charles Bloom. The students asked Bloom to name the journal who decided on Toyon because he “thought it sounded nice.” Like many Toyon volumes to follow, the first one was created with a statement of intent explaining that the journal was created with the hopes of simply encouraging students to share their creative written works and was not intended to promote any singular opinion or point of view. Bloom even had a few pieces of poetry published in the early volumes of the journal. 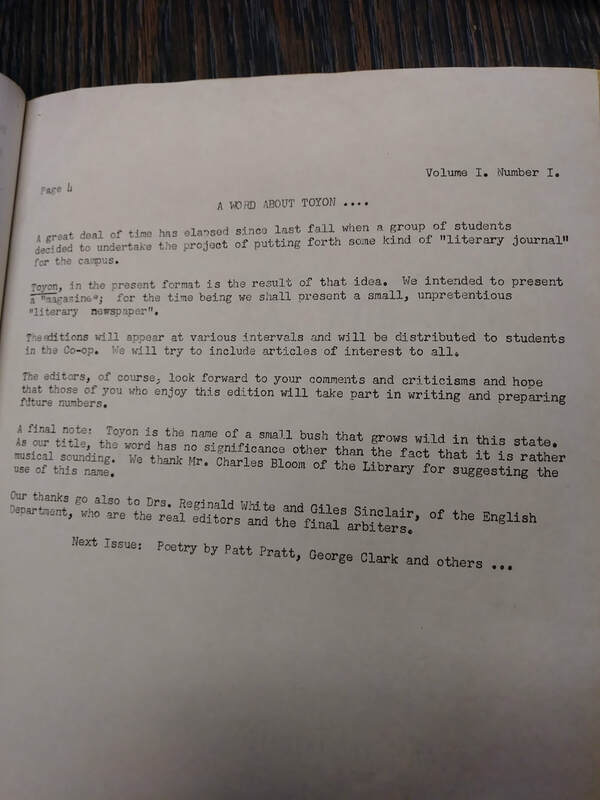 Original Editorial Letter, from First Toyon Staff in 1954.